A couple of years ago when we first made our jalapeño gravlax, I was pondering things to make with it. 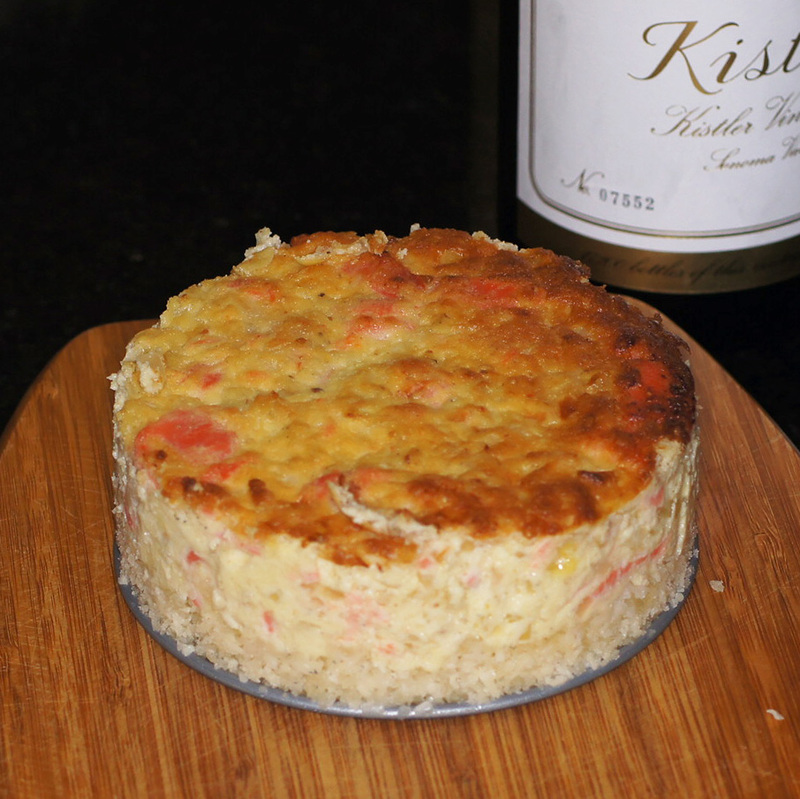 As I was surfing the net I came across a blog, L’Exquisit, that had a recipe for a smoked salmon cheesecake. I was fascinated by it as soon as I saw the title. I could just taste it. I have been wanting to make this recipe for a while, almost 2 years. Like most other recipes I have been wanting to make, I never got to this one. That is until yesterday. With all of the gravlax I made recently, I really needed to use it. 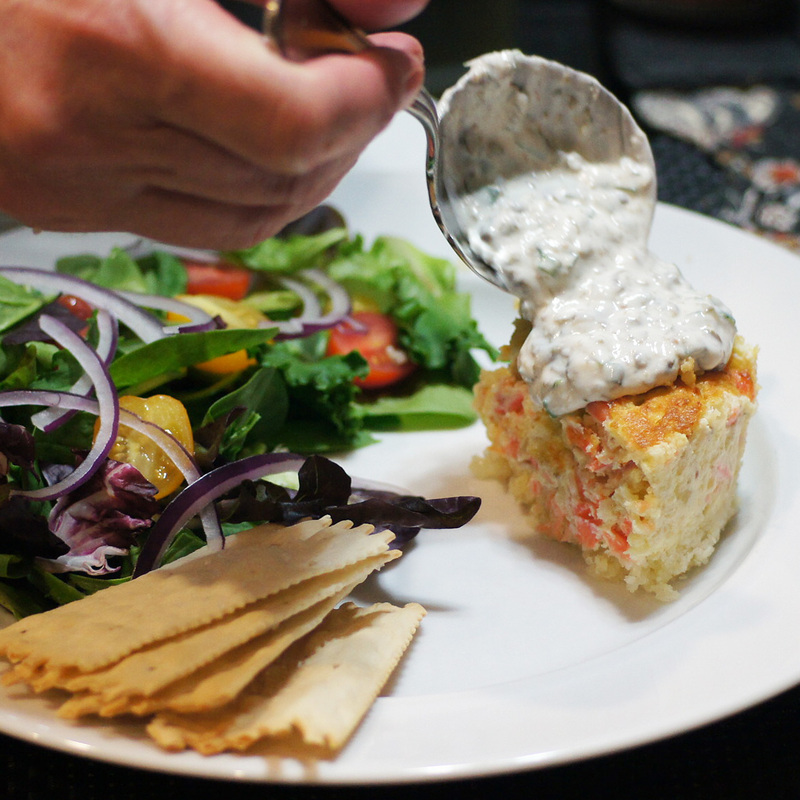 Remembering the recipe for the smoked salmon cheesecake, I found it in my computer index of recipes to try and try it we did. It was a smashing success all of the way around. It isn’t difficult to make so there really is no reason not to make it unless, of course, you don’t like salmon. If you do like salmon then you really need to give this a try. It is absolutely delicious but beware – you will not want to share this. 🙂 This is what we did. 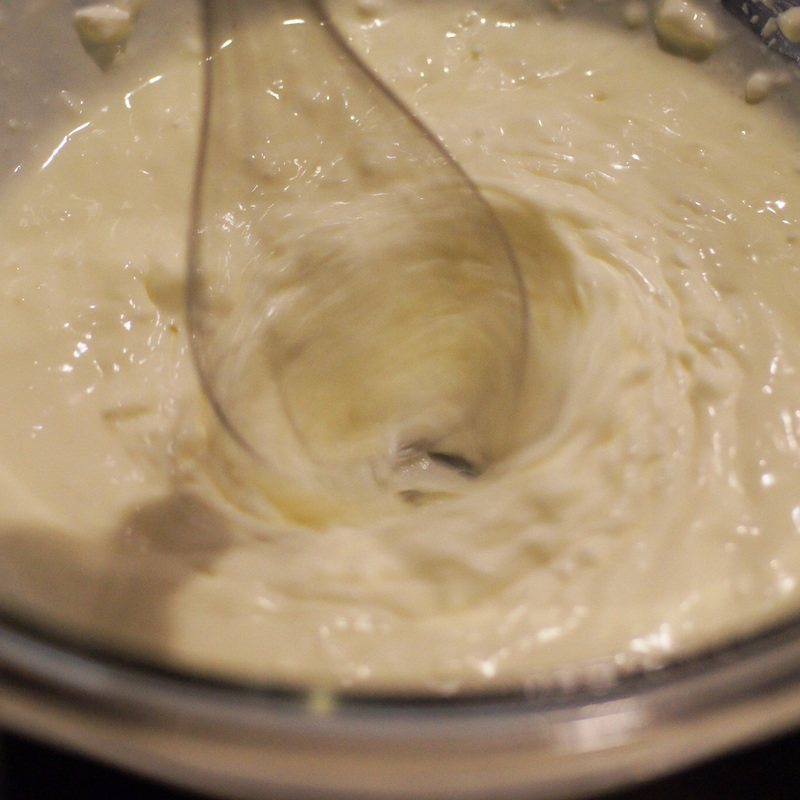 and then the melted butter. 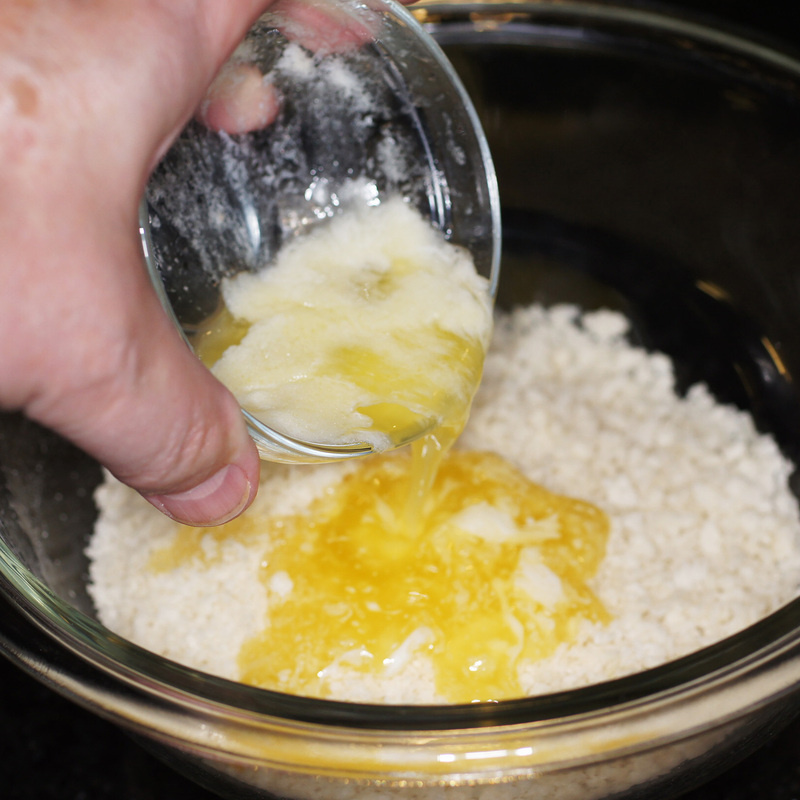 Mix together with your fingers until completely incorporated. 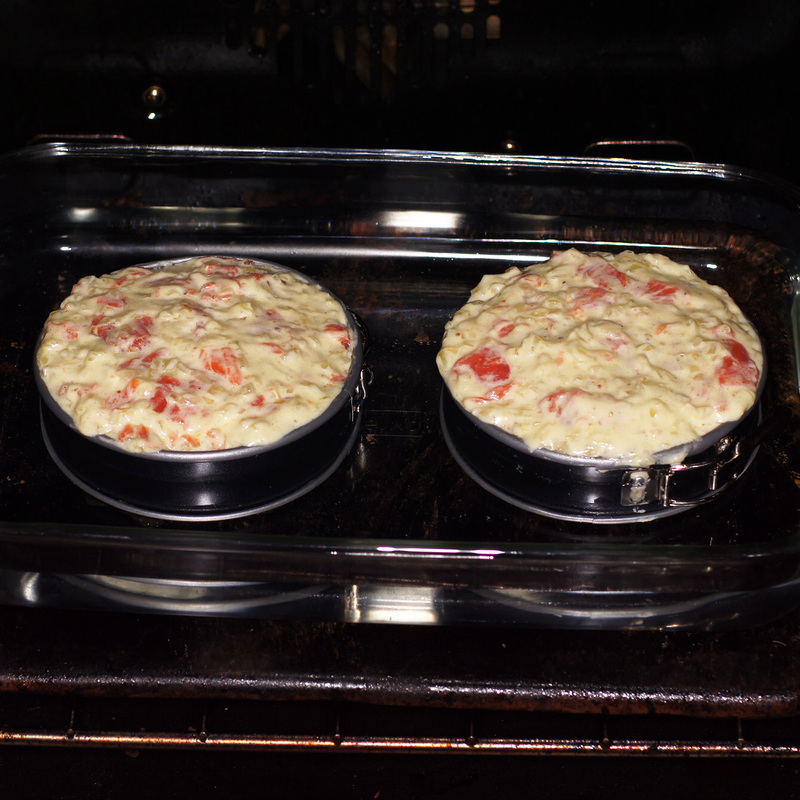 Split the mixture in 2 and press into the bottom of tow (2) 4.5 inch springform pans. These are really cute and I love it when I get the opportunity to use them. 🙂 Put the pans in the fridge until after the filling is completed and you’re ready to make the cake. 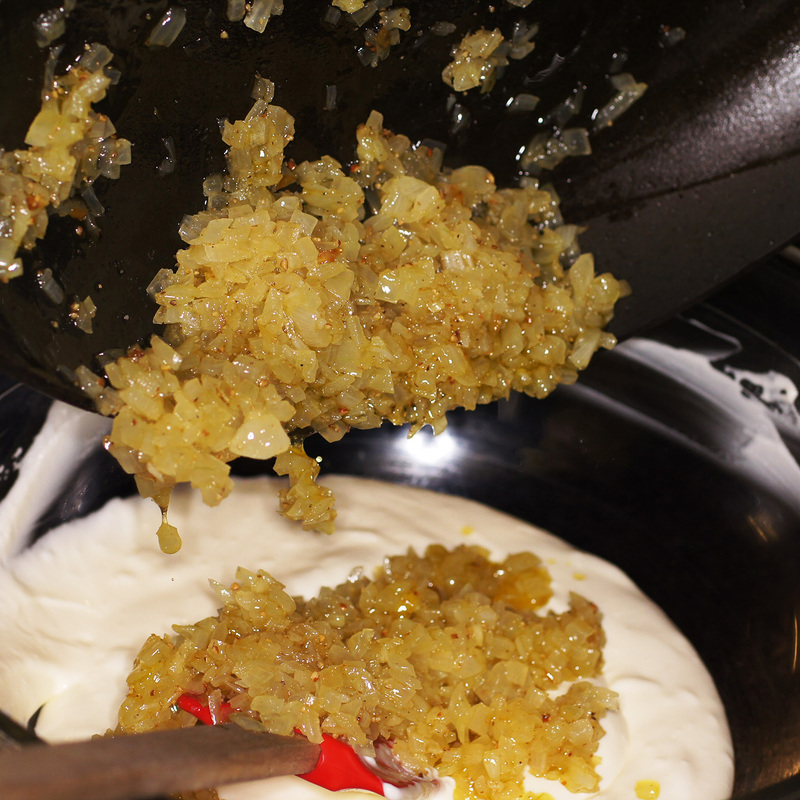 Now, make the filling for the cake by adding 2 Tbsp olive oil to a sauté pan over medium high heat. 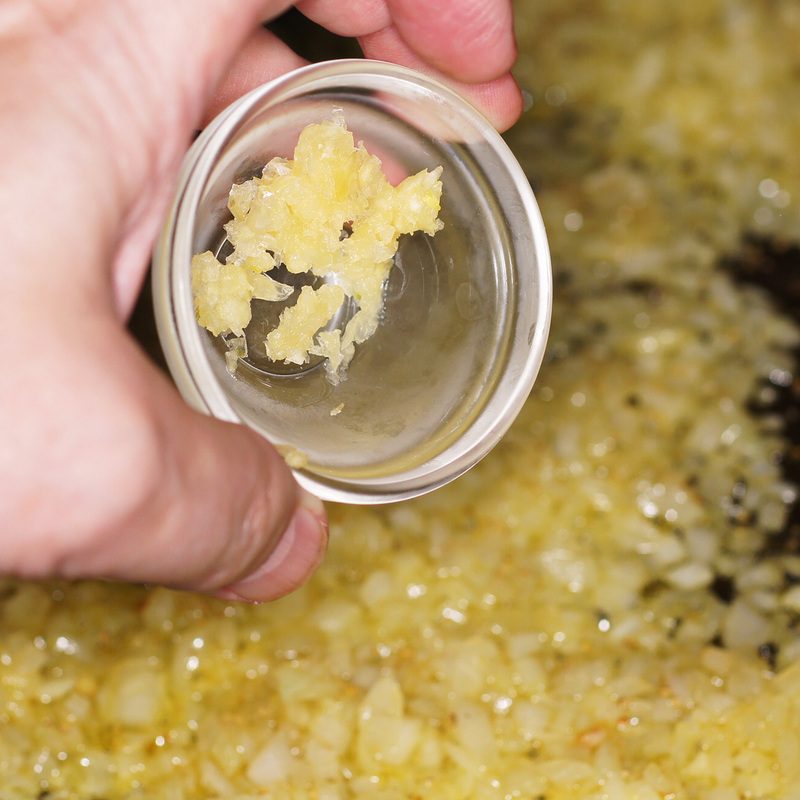 When the oil shimmers, add the onions and sauté until soft and translucent. Next add the garlic. 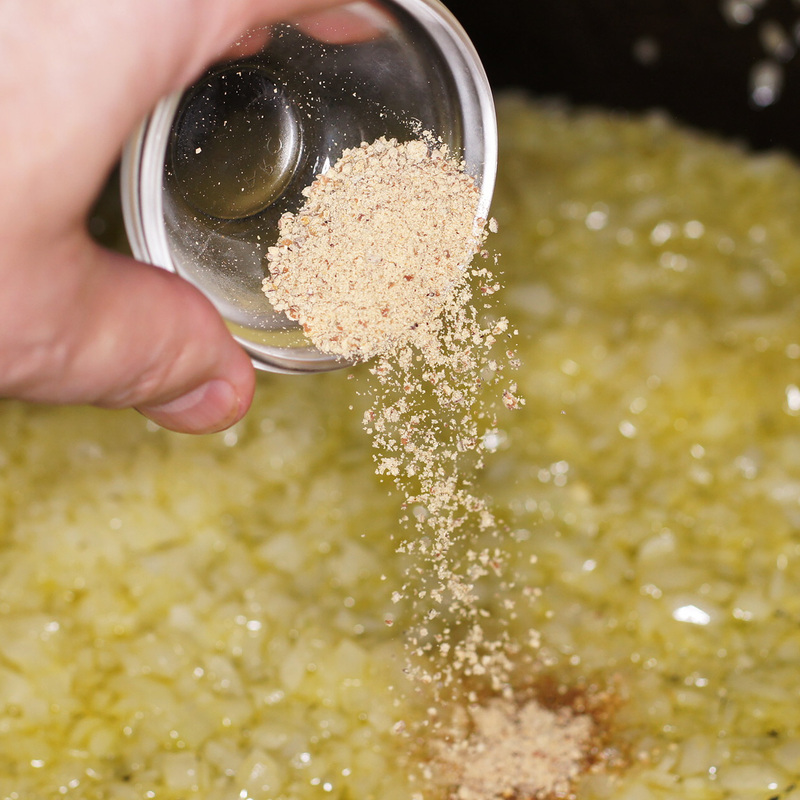 Sauté until the garlic becomes aromatic then remove from heat and allow to cool. 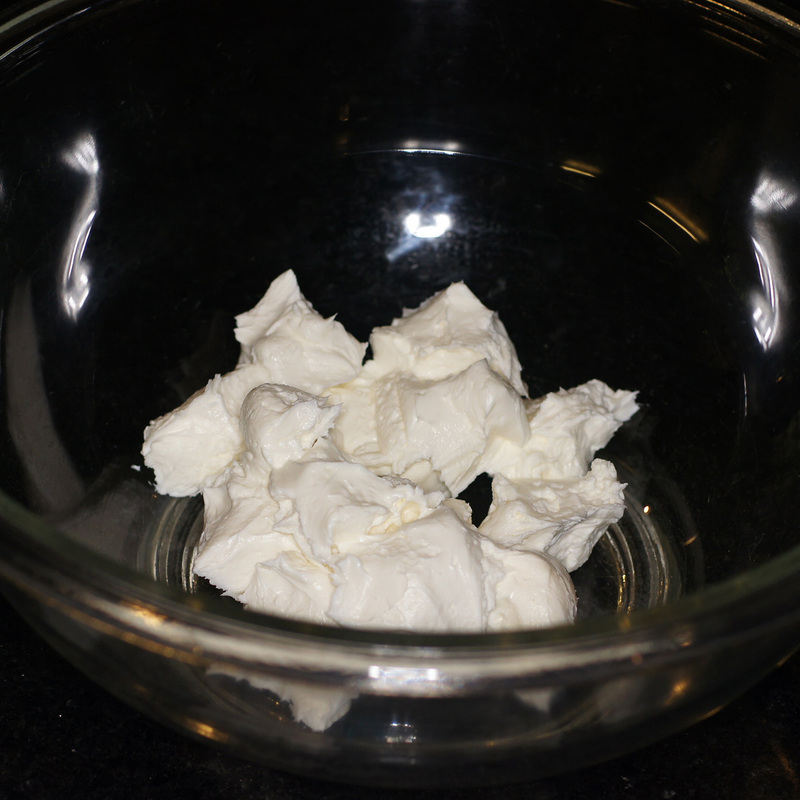 Add the softened cream cheese in small chinks to a mixing bowl. 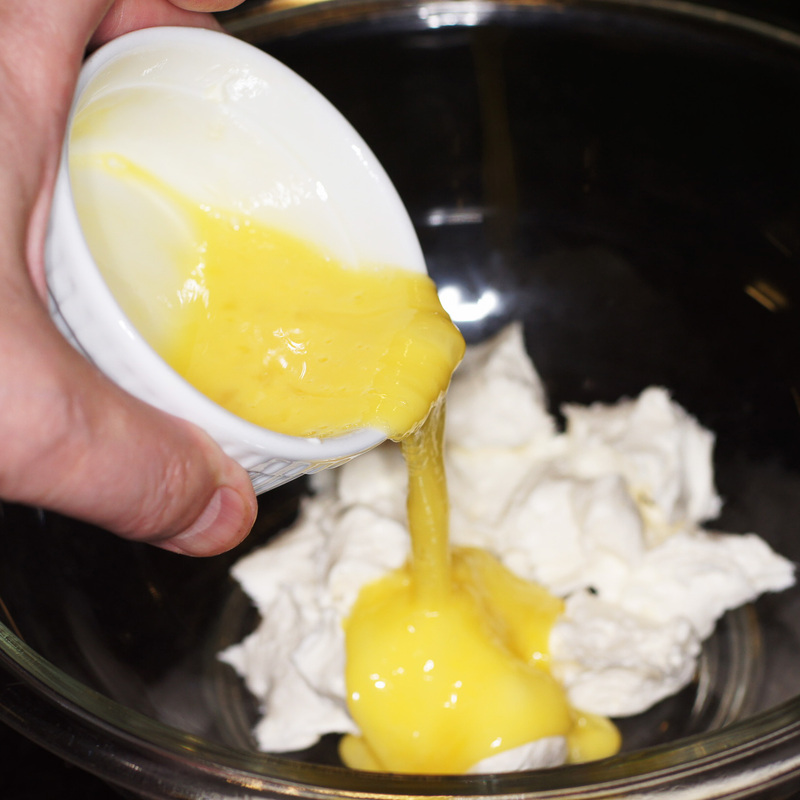 Pour in the beaten eggs. Get your trusty electric whip and mix thoroughly while you try to take photos. I really get lost when Baby Lady isn’t around to help. The photos also aren’t quite as good. Que sera sera. 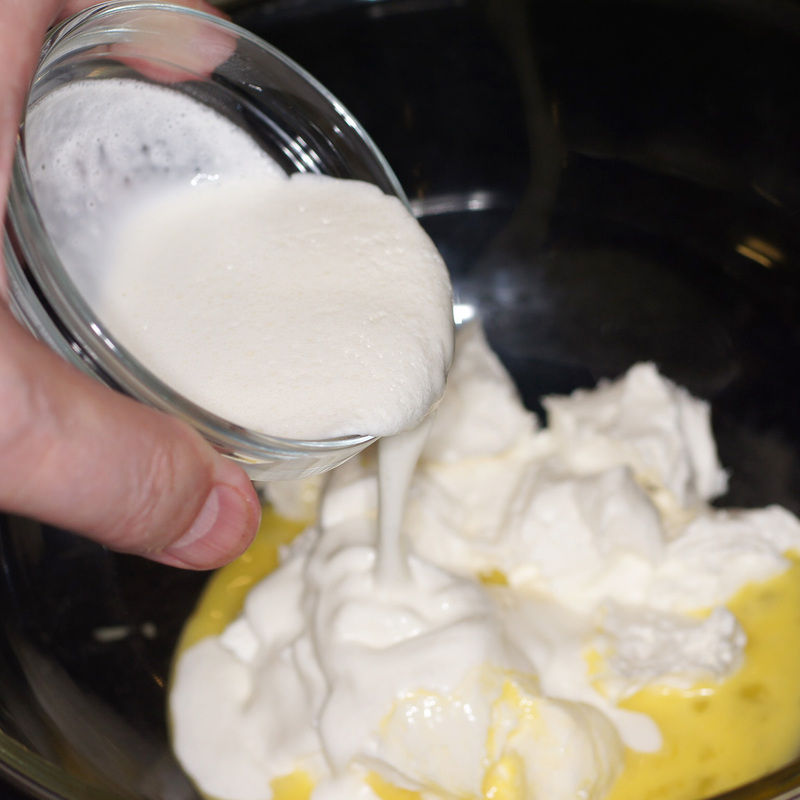 When the eggs, cream and cream cheese are thoroughly mixed and incorporated add the onions. Stir to completely incorporate. Trying to catch all of these action and pouring shots for Conor’s pleasure is really taxing. Where is the Baby Lady when I need her???? 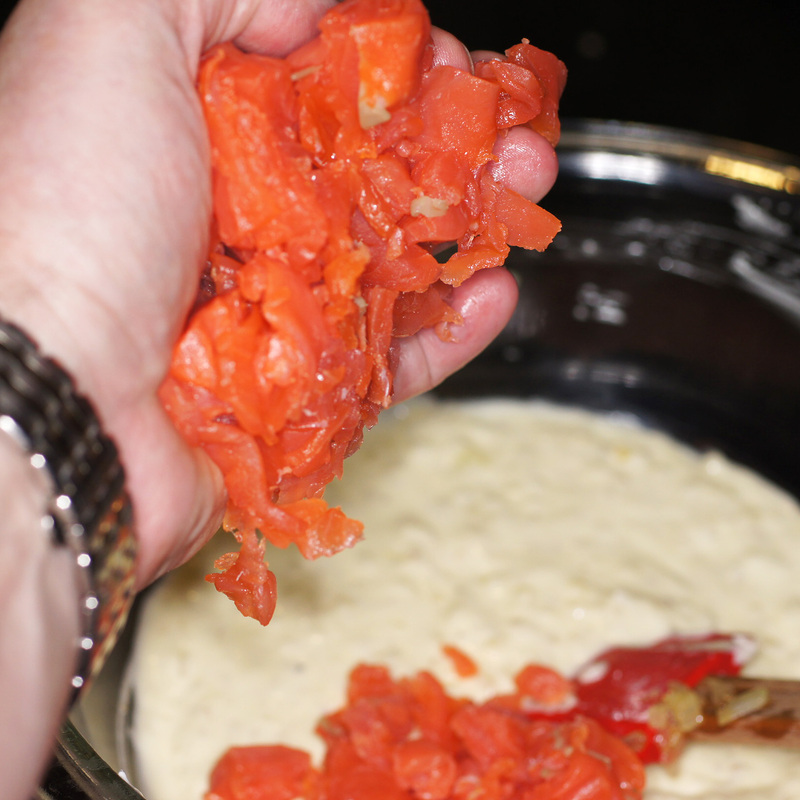 Chop the salmon into chunks, not small chunks either, and add to the mixture. Gently stir into mixture so as not to crush or break up the salmon. 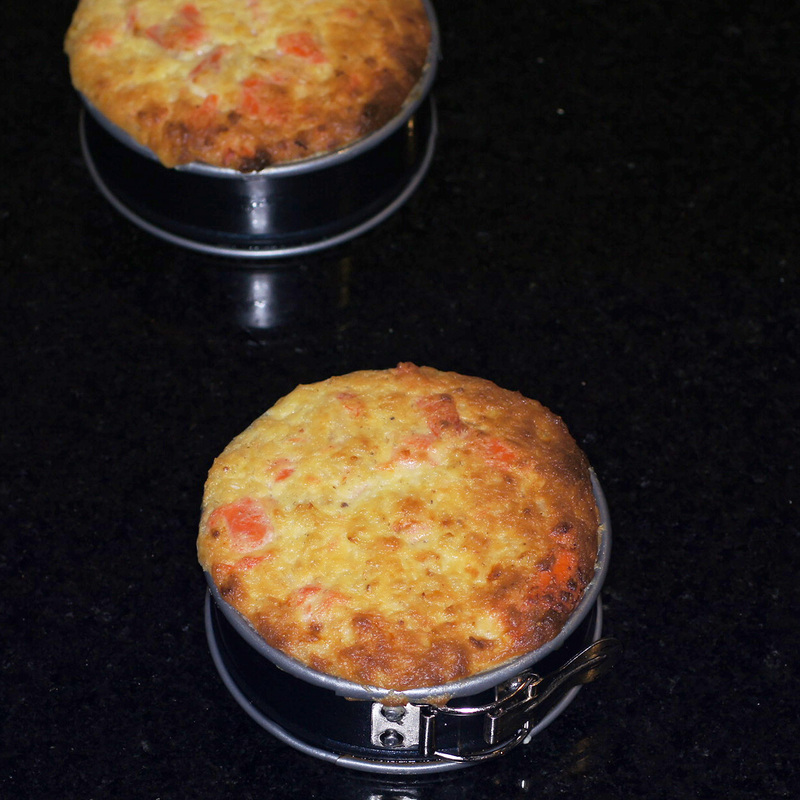 Now, get the cute little springform pans out of the fridge and apportion the filing among the 2 pans. 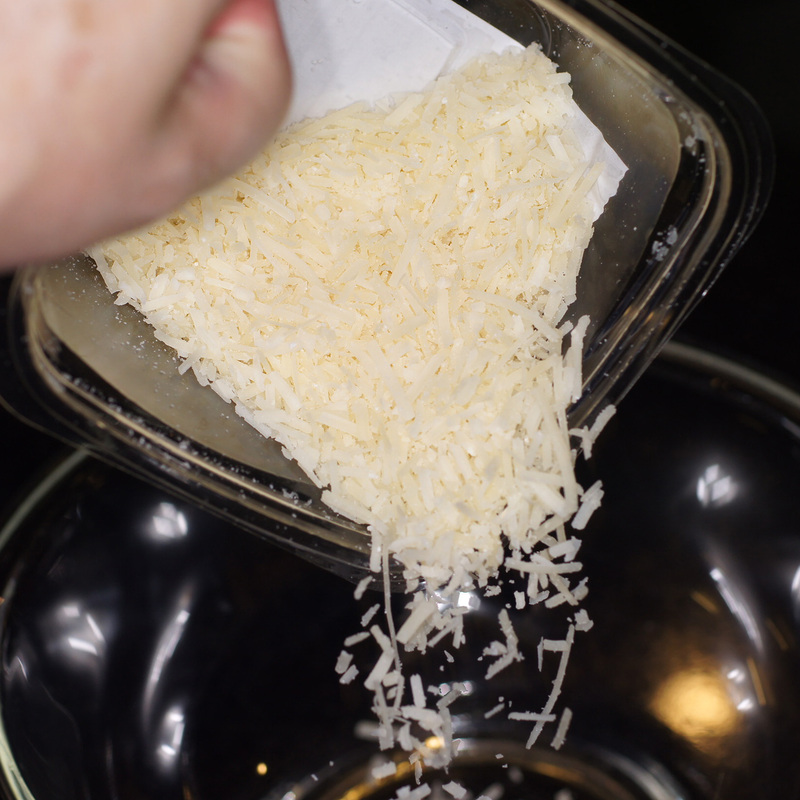 Place in a water bath at 350 F. Cook for 40 – 45 minutes or until a toothpick placed in the middle comes out clean. 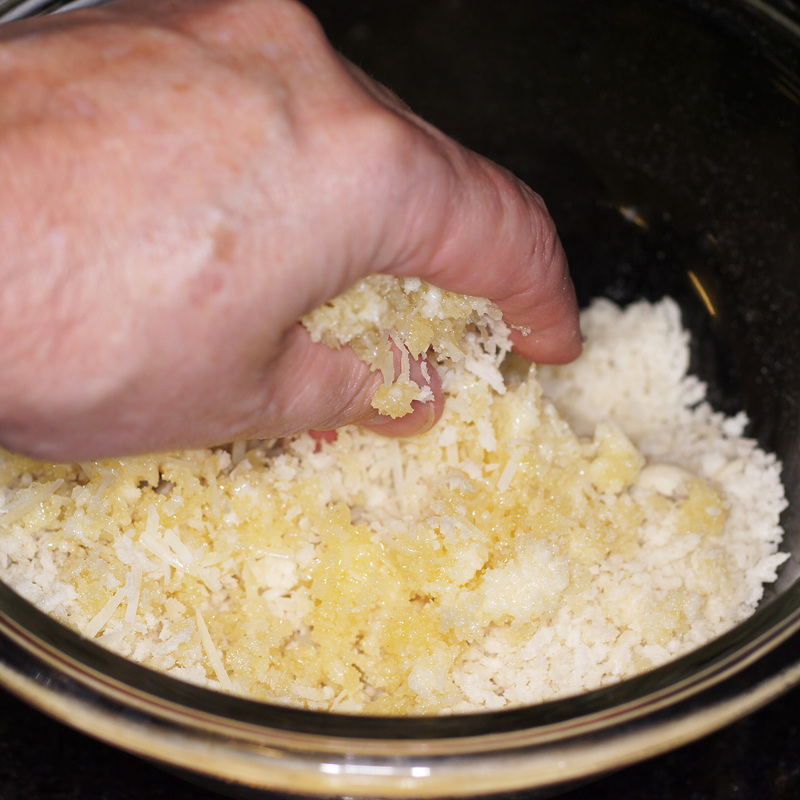 Remove from oven AND water bath and allow to come to room temperature. 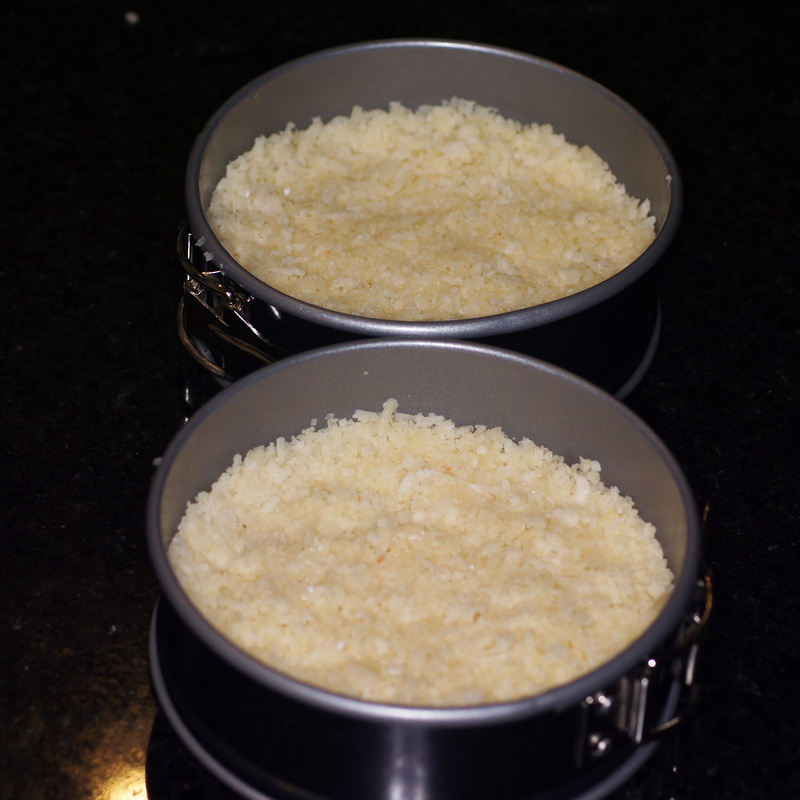 When room temperature is reached, place the cheesecakes in the fridge for 2 hours, minimum to allow them to firm up. After the appropriate resting period has been achieved, remove from the oven. Run a knife around the edges of the springform pans to loosen the cake from the sides. Remove the sides of the springform pans and set aside for someone else to clean – you’ve been slaving away all day on this delicious meal so why should you have to do all of the dishes???? Pretty nice looking cheesecake, huh? if you’re really hungry, just forego the slicing and eat a whole small cheesecake by yourself. We sliced them into thirds and served everyone thirds plated with a nice green salad. In retrospect, this is the perfect size for a nice lunch but for dinner we wanted something more substantial and ate the rest. Hence, it would have been easier simply to have cut them in half and served a half cake per person. As calorie laden and rich as this is, it’s still a pretty light meal. 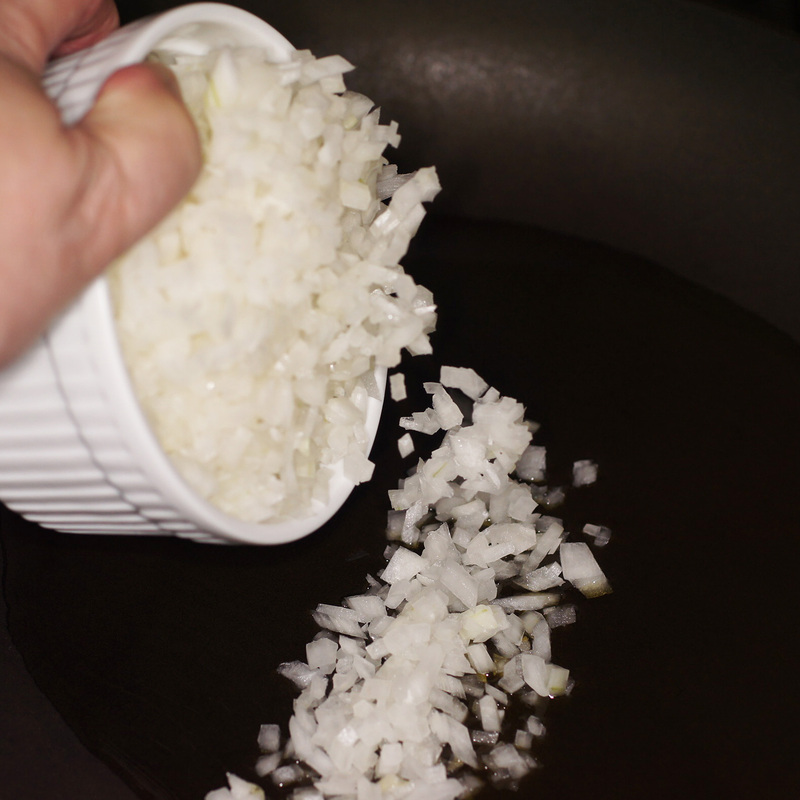 and sprinkle a little finely chopped chives over the top. Serve & enjoy. 🙂 This is incredibly delicious. NOTES: While Baby Lady thought the Jalapeño Gravlax was remarkably tasty and well worth doing again, she loved the sauce. In fact, she licked the ladle clean. 😮 This sauce would go well with almost any fish and would serve as a tasty sandwich spread, too. So sad I didn’t get photos of making it, too, but it is so simple to make photos aren’t necessary. You wouldn’t normally think cheesecake and salmon as a pair but this looks amazing! Thanks Sandra. It really was fantastic. 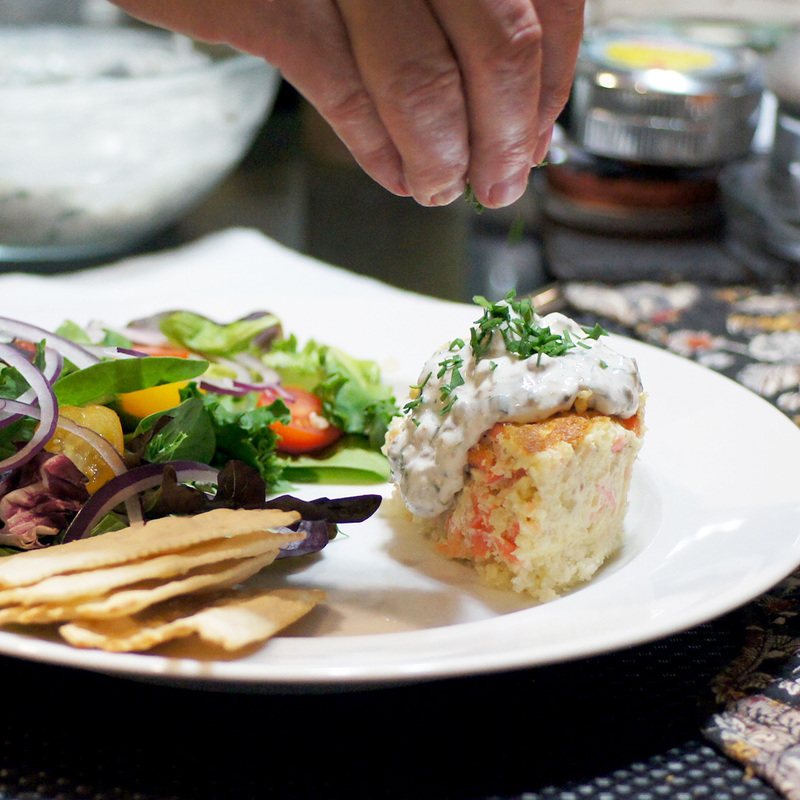 Next time you make a lot of gravlax, give this a try. Actually, she liked the sauce so much she asked me to fix fish tomorrow so we can do the sauce again so I can take pictures. 😮 She loves the sauce that much! You need to give this a try. 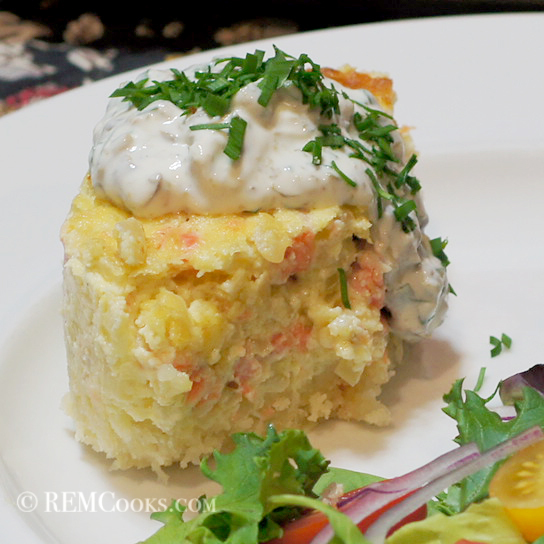 Quartered, the recipe serves 8 a nice appetizer or a light lunch. 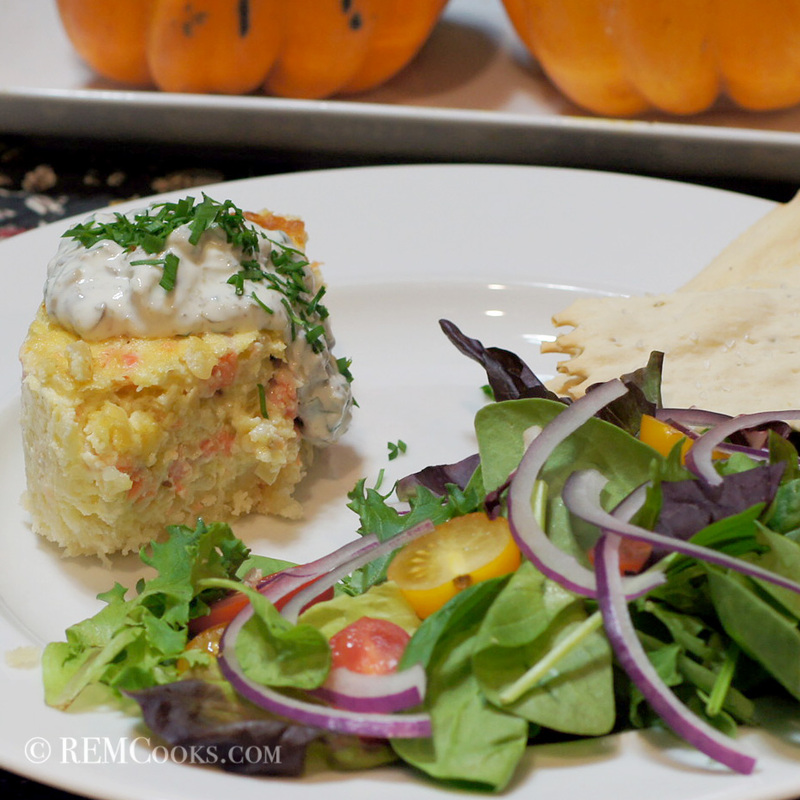 I am thrilled to have this recipe and must create an occasion to serve this outstanding combination. Question: How important is the Aquavit? I ask because I’m not sure how I’m going to use the rest of the bottle. Thank you for sharing this show stopper. Hi Linda. We’re glad you liked the recipe. 🙂 The Aquavit isn’t that important. It’s a caraway flavored liquor that imparts very little flavor. Some people omit it altogether; whereas, others use vodka. We have a bottle we have had for 2 years. 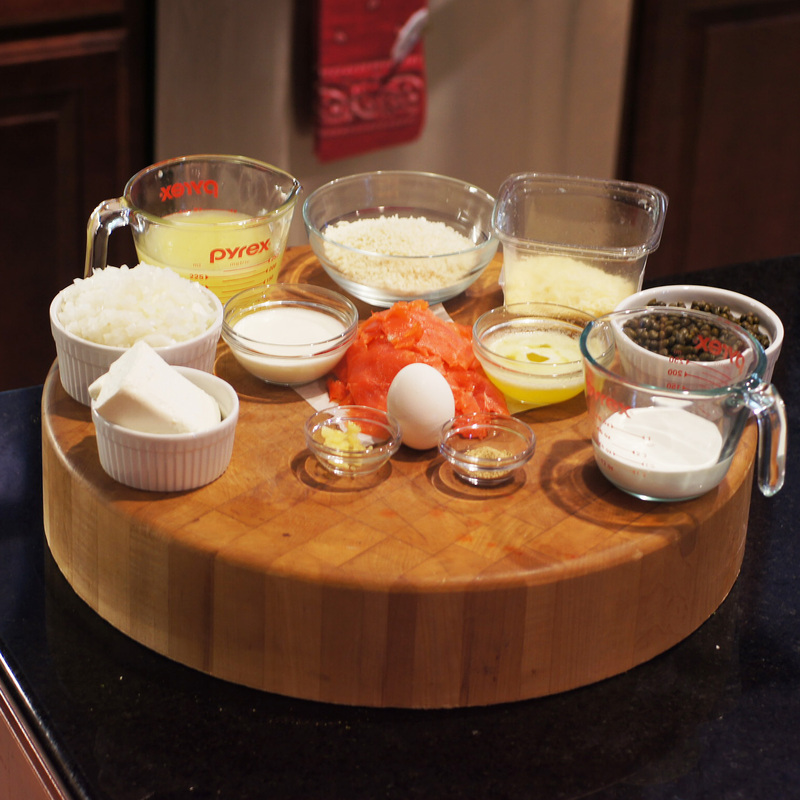 It doesn’t get a lot of use but we do make gravlax at least 3 times per year – we really do like lax and bagels. So, it’s nice to have on those occasions. Richard – please forgive me as I do not mean to be offensive! Feel strongly enough about this to ‘break’ my ‘September off’ rule at present catching up with ‘real’ life! This dish may be lovely indeed and I am happy your wife does enjoy, but it very definitely should not have ‘gravlax’ in its title. If one uses that specific term, the salmon should be made in its classical Scandinavian manner [and, being Estonian, this was the very first recipe I was taught as a child!] with a salt/sugar/dill mixture only [and certainly longer than 24 hours curing]. I even object to vodka in the curing mixture but some Swedish and Danish cooks do slip it in these days. And it should be used in its classic way. There is absolutely no reason why you or anyone else should not ‘cure’ the salmon with beetroot or chillies or whatever, but, please give it another name! 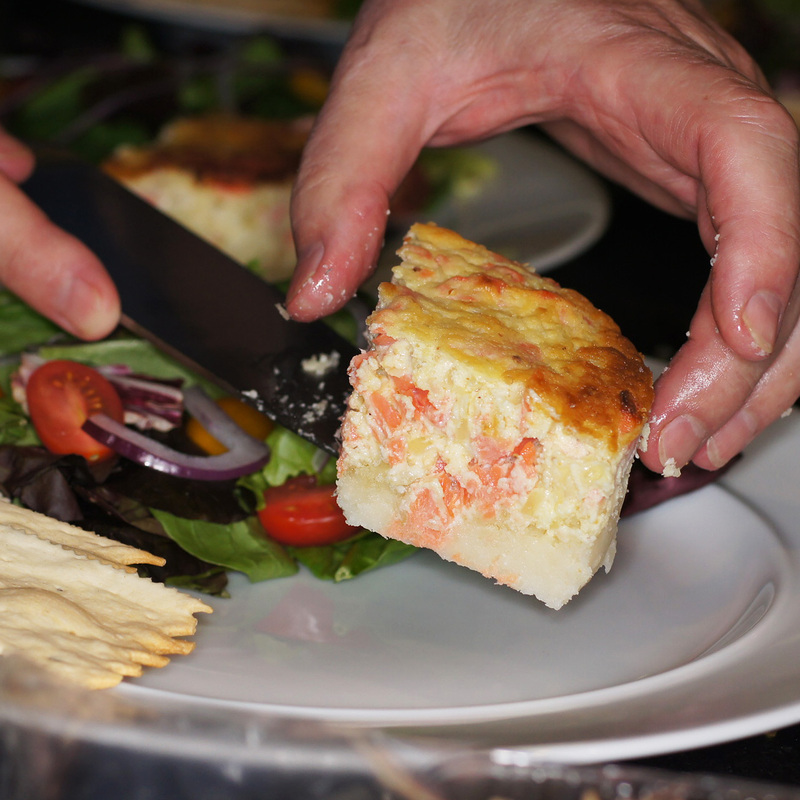 And however delightful the ‘cheesecake’ – perchance it should be called a chilies cured salmon one . . . .? Hi Eha. I appreciate your comment and take no offense. Over the years I have had several comments about how I choose the titles/names I choose. As you correctly pointed out, “gravlax” is a Scandinavian dish consisting of salmon cured in a sugar/salt cure flavored by dill, lots of dill, and a shot of Aquavit. 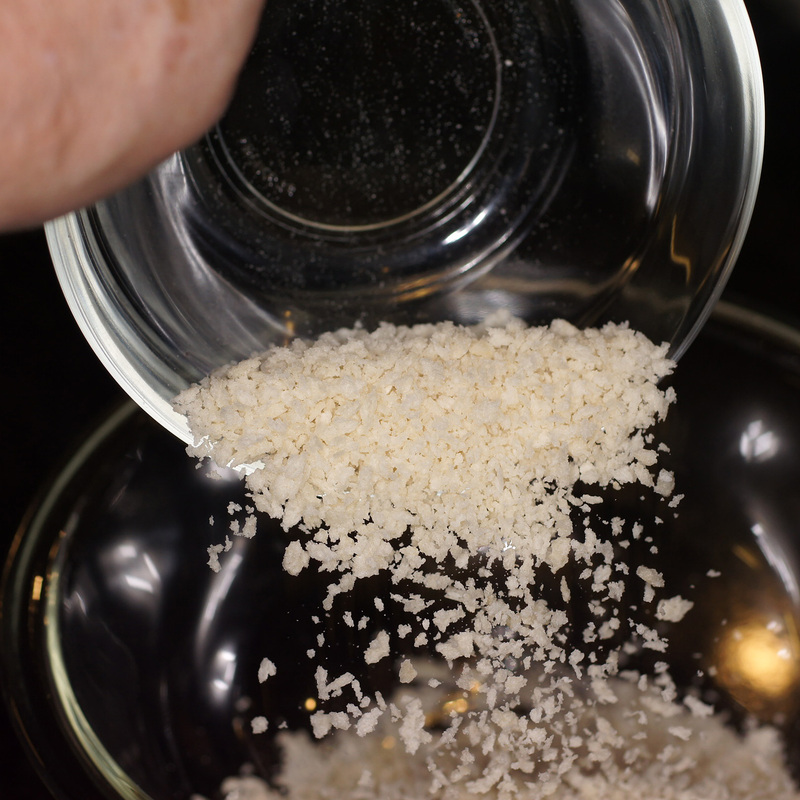 It is cured for at least 24 hours but not more than 48 hours because it becomes too salty after 48 hours. Traditionally, it was buried in the sand which is where the name originates. With the advent of refrigeration, it is now cured in the fridge. The cure I use and the style of curing are both traditional Scandinavian methods with the exception of the jalapeños. I now point out in the post that it is not traditional and that if you want the traditional gravlax omit the jalapeños. When someone says gravlax, people think of traditional gravlax (or smoked salmon which it is not). Hence, the word “gravlax” conveys a particular meaning, i.e. a style of curing salmon. Inasmuch as this is not a traditional gravlax but one with a Southwestern spin on it and not served in the traditional gravlax manner, I chose to call it “Jalapeño Gravlax Cheesecake” to convey that it is a style of gravlax that is not traditional but has jalapeño added and is a cheesecake. This way the post and recipe convey a meaning to those interested in reading it. Dear Richard – actually felt bad about posting this yesterday – the debate of course is not about your method of having created the dish but the ‘right’ to still call it gravlax, which is probably the ultimate purist classic in Northern Europe! Always served in finely diagonal slices, ALWAYS accompanied with Swedish sweet mustard sauce [that is about 30-40 % of the dish!] and either fine black/rye slices of bread or tiny unpeeled steamed potatoes. Like beef stroganoff, beef in burgundy, cassoulet, ratatouille etc there is an ‘accepted’ age-old recipe and, I have found for decades, many object to keeping the classic name if one uses fusion/personal methodology!! To each their own . . . .
Love a bit of food innovation – never seen that before! This is definitely my kind of cheesecake! The pictures are already making my mind water 😛 Now if only Andy liked lox half as much as I do… Also, do you think it would be good with regular gravlax?